Those who live in high-rises or apartment buildings may experience more plumbing problems than those who live in houses due to the cumulative burden that is placed on the plumbing system. While those who live in high-rises should follow similar guidelines to prevent plumbing problems (such as not treating your drains as garbage cans), here are some common plumbing problems that often occur in high-rises. Clogged toilets is perhaps the most common plumbing problem to affect those who live in high-rises. This can occur for several different reasons, including a build up of paper or other material in the pipes or even a broken sewer line. While a toilet plunger may be enough pressure to get rid of the clog, in some cases you may need to run a snake into the drain. If that doesn’t work, calling a professional will be the only remedy. Clogged drains is also another common problem. This can be due to a build up of grease (in kitchen sinks), soap residue or hair. Next to clogged toilets and drains, leaky faucets is another common problem in high-rise buildings. Keep in mind that even a small leak can cause major loss of water and unexpected hikes in your water bill. Unseen leaks, in particular, can cause a lot of damage to floors and walls. Leaky faucets are usually due to a worn rubber washer that simply needs to be replaced. A common problem in high-rises is residents experiencing slow draining. This is generally because of a blocked pipe due to overuse of draining cleaners, which can damage pipes and weaken them. Chemical drainers, in particular, actually corrode pipes, as well as pose health risks. Drain cleaners should always be avoided, whether you live in a high-rise or a house. It is not uncommon for high-rises to experience flooding. The most common cause of this is actually due to a corroded hose in a washing machine. 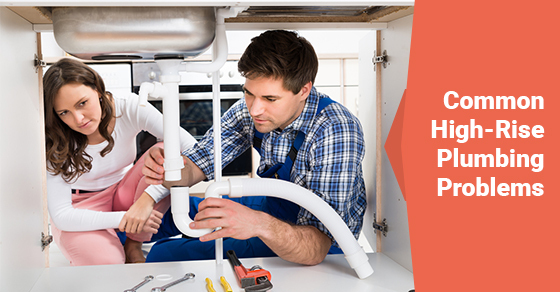 To avoid this problem, it is recommended that you inspect the connection between your washing machine and the building’s plumbing system. Flooding can also occur due to frozen pipes, which then crack and cause leaks and/or floods. To prevent this from happening, those who live in apartments can open up cabinet doors that have exposed pipes, allowing warm air to circulate around them. Lastly, floods can also occur when tenants try to resolve a plumbing problem by themselves but they forget to turn off the water.